This product has been discontinued. 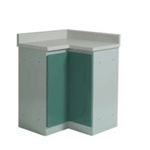 Click here to return to UMF Cabinets. 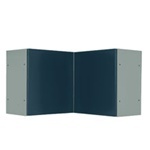 Wall hanger strips with holes included. Finding the exact medical supplies you need for yourself or your patients can feel like a wild goose chase. 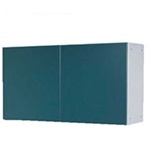 Fortunately, you've found a great place for all yourneeds, including UMF Modular Cabinets, 30 X 30 Corner Wall Cabinet. Medical Device Depot seeks to change the way physicians and other health care professionals purchase their medical equipment worldwide by your on- and off-line shopping experience with us worry-free.� Our experienced customer service representatives will be happy to provide you with valuable advice regarding products relevant to your practice. You can always visit the 'My Account / Order Status' link at the top right hand side of our site to view orders you have placed, change or cancel an unprocessed order, track your shipping and more.Sales tax will be charged on any orders shipping to the state of Maryland only. All other orders will be tax-free. Medical Device Depot offers financing options via LeaseStation for all credit types and new and established businesses. Our site offers the highest level of security and encryption, backed by Volusion Secure Site SSL and Norton Secured by Verisign, so you can shop worry-free.